Kalvakuntla Taraka Rama Rao, popularly known as KTR, is the Working President of TRS Party. He is the Member of the Legislative Assembly from Sircilla Constituency since 2009. 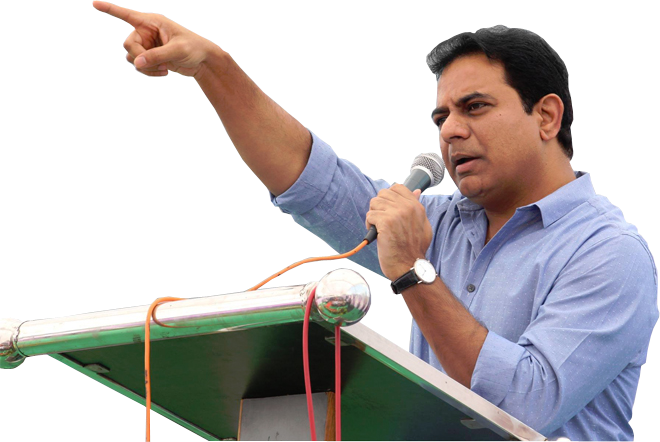 Born in Siddipet on 24 July, 1976, KTR is the son of K Chandrashekar Rao, the first Chief Minister of Telangana. He grew up in a politically active family and completed his schooling from St. George’s Grammar School, Hyderabad before going to Nizam College, Hyderabad. He studied M.Sc. in Biotechnology from University of Pune and also holds an MBA degree in Marketing and E-Commerce from City University of New York, NY. After finishing his MBA, KTR worked in USA between 2001-06. But his interest in the prevailing socio-economic condition in the region brought him back to where his heart belongs – politics. He joined Telangana Rashtra Samiti (TRS) and worked under the leadership of his father to bring Statehood to the region of Telangana. During this period, he travelled the length and breadth of the State and interacted with people to understand their problems and aspirations, which later helped in shaping his political career. KTR made his political entry in 2009 Assembly elections. He assumed the charge of a cabinet minister in the first Government of Telangana in June 2014. KTR has embarked upon an aggressive plan to develop the IT and high-tech industry in the new State after assuming office. His aim was to double the IT exports from Telangana in the next five years. He has already taken-up several initiatives in this regard that includes creating proactive and business-friendly industrial, IT and electronic policies; facilitating electronic manufacturing ecosystem in the state; promoting entrepreneurship through creation of T Hub – India’s largest incubator for startups; generating skilled workers through Telangana Academy of Skill and Knowledge (TASK) and offering quality education and training to identified groups through State-run Satellite Communications and IT set-up i.e. Society for Telangana Network (SoFTNET). The State has launched historic Water Grid project to provide tap water to about 8 million homes; this project piggybacks optic fiber in the same trench to create the most extensive broadband network in India. Taking a step ahead to deliver government services to the rural citizens over internet, he has initiated the E-Panchayat project. KTR received Audi-Ritz Inspirational Icon of the Year Award (Politics) for 2015 and Skoch Challenger Award in Start-up India category for Telangana’s path-breaking initiative T-Hub.